Hi again! I'm back with a 3rd card to share tonight. I used Bambi Bubble Gum from Kraftin' Kimmie Stamps and colored it using Spectrum Noir pens. I also added a little gloss to the glass on the gumball machine using a white gloss pen. I layered card stock, embossing and gems to finish the front of my card. I created the star paper by adding lime green ink to a star embossing folder and then embossed a piece of white card stock. The color combination I used is from the challenge at Crafty Gals Corner. I used the green and soft blue as the main colors on my card and added just a "POP" of purple by adding the purple gems. wow a card......my style.....thanks for joining the challenge at Cheerful Sketches. Good luck!! Your card is great Mary. 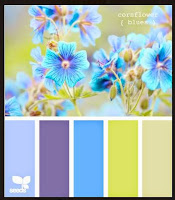 I love the very beautiful colorcombination and that cute image. Thank you for joining are challenge at Cheerful Sketches. 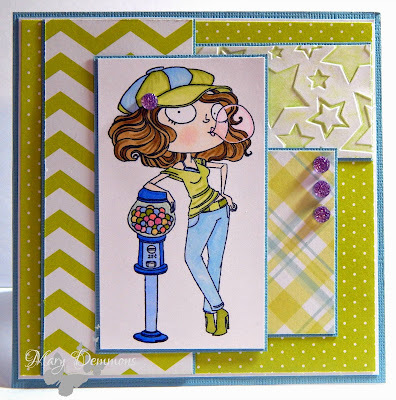 Gorgeous card Mary...thanks for joining us at Cheerful Sketches! Oh what a lovely card and i truely love the stamp and colours you used, thanks for playing along with our challenge at the Cheerful Sketches Challenge Blog. She's lovely Mary. I love the stary background too. A super cute project, Mary. LOVE the colours. Thanks for playing along with Polka Doodles Girly But No Pink challenge. Great card with lovely colours! Thank you very much for joining out challenge at Creative Card Crew. Good luck! wow love this awesome layout. Just adore the star border!!! !